The first collection of short fiction from the Pulitzer Prize-winning author Jeffrey EugenidesJeffrey Eugenides’s bestselling novels have shown that he is an astute observer of the crises of adolescence, sexual identity, self-discovery, family love, and what it means to be an American in our times. The stories in Fresh Complaint continue that tradition. Ranging from the reproductive antics of “Baster” to the wry, moving account of a young traveler’s search for enlightenment in “Air Mail” (selected by Annie Proulx for The Best American Short Stories 1997), this collection presents characters in the midst of personal and national crises. We meet a failed poet who, envious of other people’s wealth during the real-estate bubble, becomes an embezzler; a clavichordist whose dreams of art collapse under the obligations of marriage and fatherhood; and, in “Bronze,” a sexually confused college freshman whose encounter with a stranger on a train leads to a revelation about his past and his future. 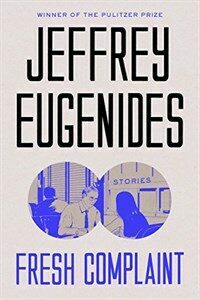 Narratively compelling, beautifully written, and packed with a density of ideas that belie their fluid grace, Fresh Complaint proves Eugenides to be a master of the short form as well as the long.